Half of the residents of Raqqa have been forced to leave the city amid the operation to drive out Daesh, SDF commander Abdulaziz Yunus told Sputnik. Half of Raqqa's residents have fled the city amid intense fighting between Daesh and the Kurdish-led Syrian Democratic Forces, SDF commander Abdulaziz Yunus told Sputnik. "Raqqa is surrounded on three sides, we are moving forward every day. We have already managed to recapture a number of districts from Daesh," Yunus said. "Terrorists carry out attacks using vehicles loaded with explosives, however we are destroying them before they reach our positions. Civilians continue to flee the city towards the safe zones we have set up. I can't say for sure how many thousands of civilians have fled Raqqa at this time, but generally speaking half the population has already left the city." The SDF is backed by the US-led coalition, and it was earlier reported that the Pentagon had deployed several marine units to the area, in addition to having previously deployed 500 special forces troops. According to the Pentagon, the newly deployed units have heavy weapons, including M777 155-mm howitzers and AH-64 Apache attack helicopters. The Marines are providing the operation with artillery and close air support. 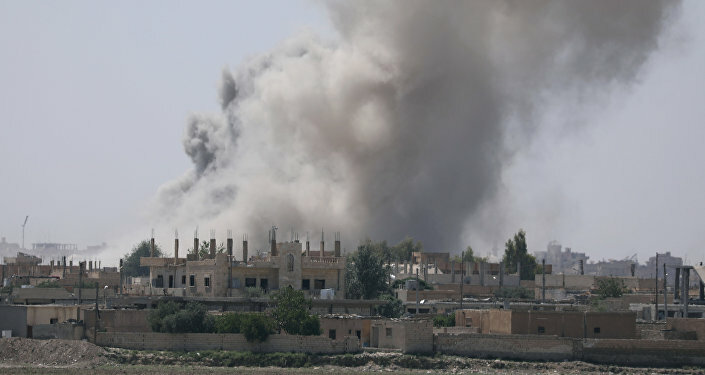 On Wednesday, the UN warned that the intensification of US-led airstrikes paving the way for SDF advance has resulted in "staggering loss of civilian life," and some 160,000 people becoming internally displaced. Raqqa and the Iraqi city of Mosul were captured by the internationally-condemned terrorist group in 2014 and served as the two strongholds of its self-proclaimed caliphate. In addition to the Raqqa operation, the US is also backing an Iraqi-led campaign to liberate Mosul from Daesh, which was launched in October 2016. On Tuesday, Iraqi officials also declared the imminent liberation of Mosul from Daesh.